These climate models have been used for many different taxa, but recently I came across the first example of such a model being applied to a cryptid. “Cryptid” is the name given to any postulated species that has not been conclusively documented. Notable examples include the Loch Ness Monster in Scotland and the Chupacabra in Mexico. This study used a database of Sasquatch sightings from the western USA to infer the climatological requirements of this particular cryptid. The point of the study was to demonstrate that researchers can provide apparently meaningful data without any actual biological understanding of the concepts. 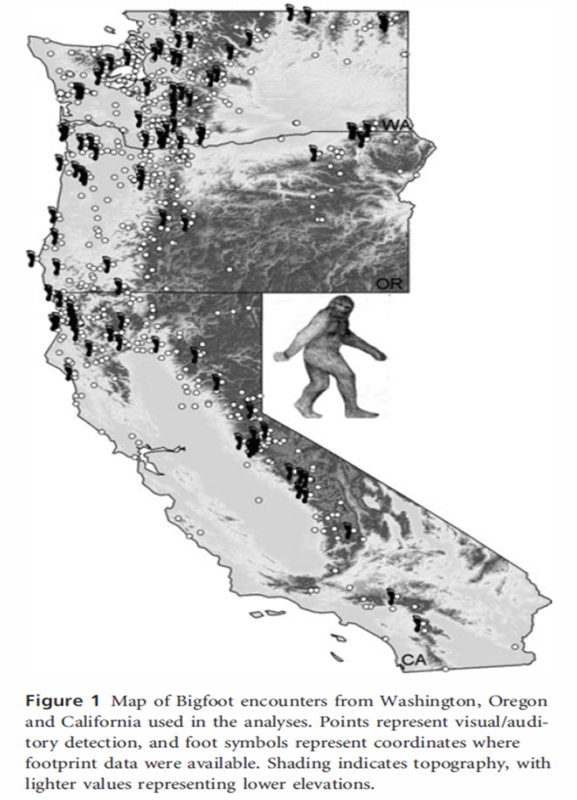 In this case, we have little or no evidence of the existence of Sasquatch, and yet the researchers published an entire paper documenting its distributions. That’s rather interesting – and a good reminder that our eyes can and do play tricks on us. Bears are very similar to humans in many ways, and the mythic image of the bear as shapeshifter is a fairly common one. It’s also interesting to see how scientific methods and procedures are applied by those who are most definitely not doing science in an effort to bolster their legitimacy. However, they generally start from a set of made up data. In this case, by assuming things about Bigfoot’s biology that they can’t possibly know. This is probably a gag, but it’s a good illustration of what happens all the time in creationist circles. It’s very much a tongue-in-cheek application of the method (in a well-respected journal). The interesting points are (i) you don’t need biology to do these kinds of things (which is a problem) and, more interestingly for skeptics, (ii) if you choose to treat pseudoscience like science, suddenly it can become testable.